We finished the Energy Matters topic last week. Here are some notes with worked examples to show how we calculate the heat energy required to change the state of matter. Values of Lf and Lv are provided inside the front cover of a question paper. We’ll finish off the course by looking at Space Physics. Most of the calculations will be based on the principle of conservation of energy. Dr. Altman has an excellent series of videos examining conservation of energy examples from Roadrunner cartoons. I have attached a pdf handout with worked examples on potential energy, work and kinetic energy. If you want some more revision materials, try here. Here are some videos on balanced and unbalanced forces affecting the motion of objects. The first clip examines the forces on a cyclist as she cycles round a velodrome. The second clip looks at the way skydivers use forces to land safely. I’ve also attached a pdf with some notes on forces, free body diagrams and Newton’s laws of motion. Download the file using the link below. We’ve been learning about forces in class and today we looked at how car seatbelts use forces to keep us safe. Mr Mallon’s HelpMyPhysics site has a short video that demonstrates how a monkey can stay safe during a trolley collision when it is given a seatbelt. Here is a seatbelt advert from Sussex, the family’s arms show what a seatbelt does. The next youtube seatbelt advert is pretty graphic – it’s designed to show what happens to our insides when we travel without a seatbelt. Here is a link to the video, please don’t click if you’re squeamish. There are several pages of notes about forces on BBC Bitesize. Remember to try their test when you have worked through the topic. Your homework exercise on resistance is attached as a pdf document. Download the file and answer the questions in your homework jotter. Hand in your jotter no later than Monday 17/12/12. 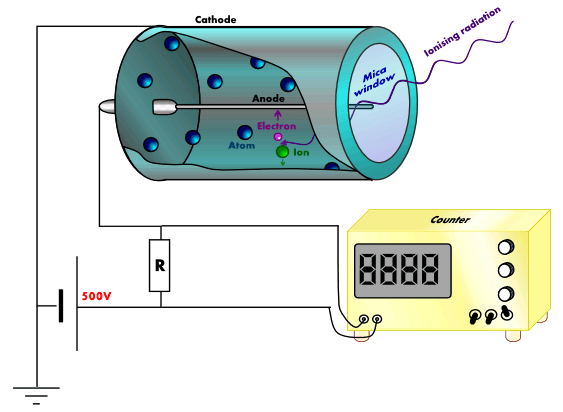 We’ve examined the operation of a Geiger-Müller counter as part of the radiation topic. The Geiger-Müller (GM) counter is used to detect ionising radiation such as alpha and beta particles or gamma rays. The radiation enters through a very thin window at one end of the tube. This window is usually made of mica. Mica is a mineral that forms in layers called sheets. These sheets can be split apart into very thin layers, so thin that even an alpha particle can pass through it (remember that alpha particles can be stopped by something as thin as your skin or a sheet of paper). The mica window prevents the argon inside the tube from escaping and also stops air from getting into the tube. When radiation enters the tube and collides with an argon atom, an electron may be knocked off the atom – we call this process ionisation. When ionisation occurs, a positively-charged argon ion and a negatively-charged electron are produced. The argon ion is attracted to the outside wall of the tube, which is connected to the negative terminal of the power supply, while the electron is attracted to the central electrode, which is kept at a high positive voltage – typically 500V. A small pulse of current is produced each time an electron reaches the central electrode. These pulses can be counted by an electronic circuit and a displayed on a 7-segment display. Sometimes a small speaker is added to the system to produce a click for each pulse. On its own, the GM tube cannot tell the difference between alpha, beta and gamma radiation. We need to place different materials (e.g. 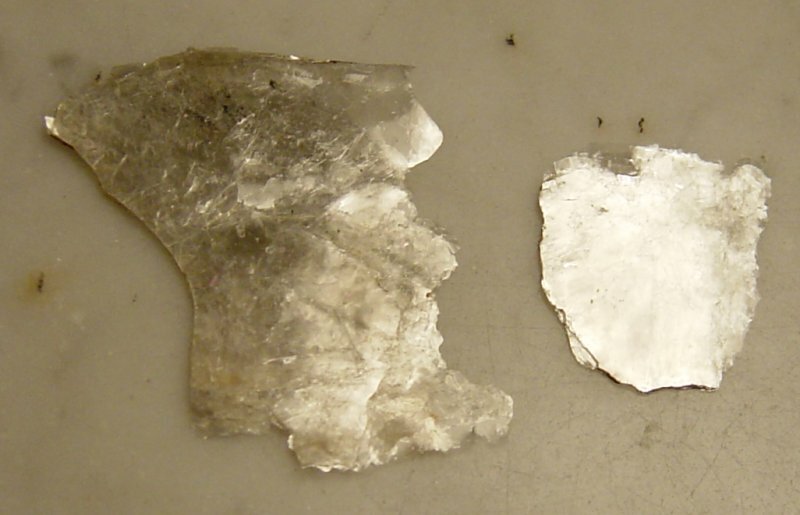 paper, aluminium, lead) in front of the mica window to discover which type of radiation is responsible for the reading. Here is a short video demonstrating the use of a Geiger-Müller tube. Last week, the BBC broadcast a Horizon programme about new cancer treatments being trialled at the Royal Marsden Hospital in London. The documentary followed three different types of treatment; robotic surgery, a genetically targeted drug and a radiotherapy robot. As we’ve discovered, standard radiotherapy treatment involves splitting the required dose into 3 beams, so only cells inside the tumour receive the full dose. The radiotherapy robot, CyberKnife, allows high energy x-rays to enter the patient’s body from many different angles. The advantage of this robot is that it minimises the risk to healthy tissue while ensuring a fatal dose of energy is delivered to the cancer cells. I have put together a series of clips from the programme to follow patient Ray’s treatment. The clip from the planning meeting shows just many individual beams the robot will use during the treatment. To find out more about how x-rays affect living cells, watch this clip from Bang Goes the Theory. The Royal Marsden Hospital has a video that provides a quick guide to radiotherapy. Use the download link below if you would like to save a copy of the CyberKnife video. Radiotherapy is one method doctors can use to treat cancer. Radiotherapy can be performed without surgery and avoids the side effects that a patient may experience during chemotherapy. In the most common form of radiotherapy, high energy x-rays are used to kill the cells in the tumour. The treatment must be planned carefully to make sure that healthy cells are not damaged by the x-rays. The dose required to kill the cancerous cells is normally delivered in smaller doses and at different angles (as shown in the diagram) to make sure that only the cells in the tumour are destroyed. Each beam delivers one third of the dose required. The beams overlap at the tumour, which receives the full dose. Here are some slides about radiotheraphy. I have attached a copy of them (as a pdf file) to the bottom of this post. X-rays are a form of electromagnetic radiation. They have a much higher frequency than visible light or ultraviolet. 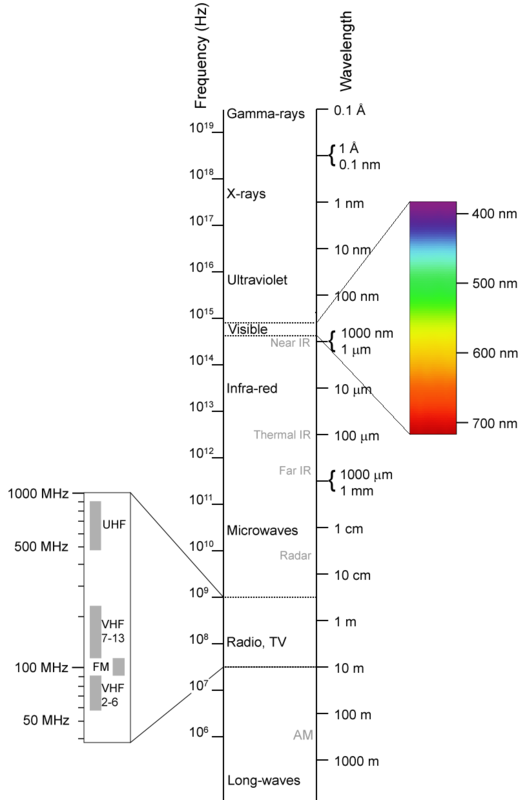 The diagram below, taken from Wikipedia, shows where x-rays fit into the electromagnetic spectrum. 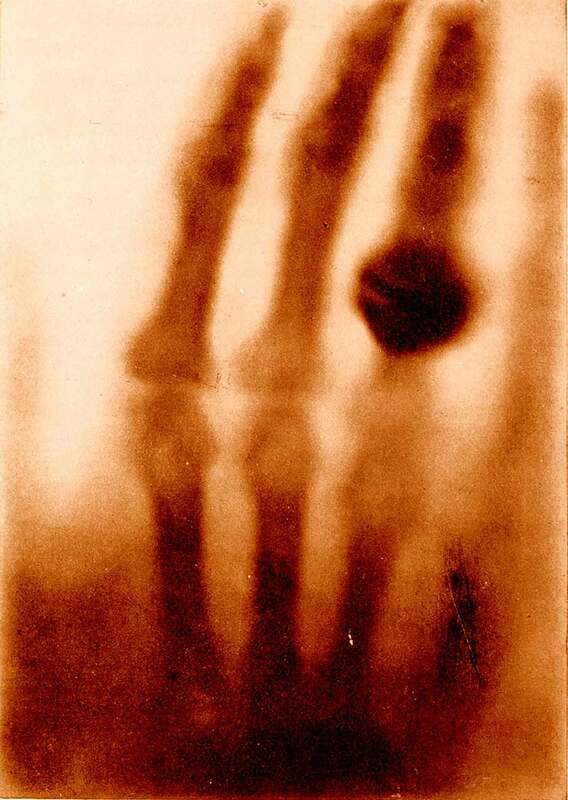 Wilhelm Röntgen discovered x-rays and the image below is the first x-ray image ever taken. It shows Mrs. Röntgen’s hand and wedding ring. The x-ray source used by Röntgen was quite weak, so his wife had to hold her hand still for about 15 minutes to expose the film. Can you imagine waiting that long nowadays? This was the first time anyone had seen inside a human body without cutting it open. Poor Mrs. Röntgen was so alarmed by the sight of the image made by her husband that she cried out “I have seen my death!” Or, since she was in Germany, it might have been “Ich habe meinen Tod gesehen!” that she actually said. Röntgen continued to work on x-rays until he was able to produce better images. The x-ray below was taken about a year after the first x-ray and you can see the improvements in quality. Notice that these early x-rays are the opposite of what we would expect to see today. They show dark bones on a lighter background while we are used to seeing white bones on a dark background, such as the x-ray shown below. The difference is due to the processing the film has received after being exposed to x-rays. In hospitals, x-rays expose a film which is then developed and viewed with bright light. X-rays are able to travel through soft body tissue and the film behind receives a large exposure. The x-rays darken the film. More dense structures such as bone, metal fillings in teeth, artificial hip/knee joints, etc. block the path of x-rays and prevent them from reaching the film. Unexposed regions of the film remain light in colour. Röntgen’s x-ray films would have involved additional processing steps. The exposed films were developed and used to create a positive. In creating a positive, light areas become dark and dark areas become light. So the light and dark areas in Röntgen’s x-rays are the opposite of what we see today. 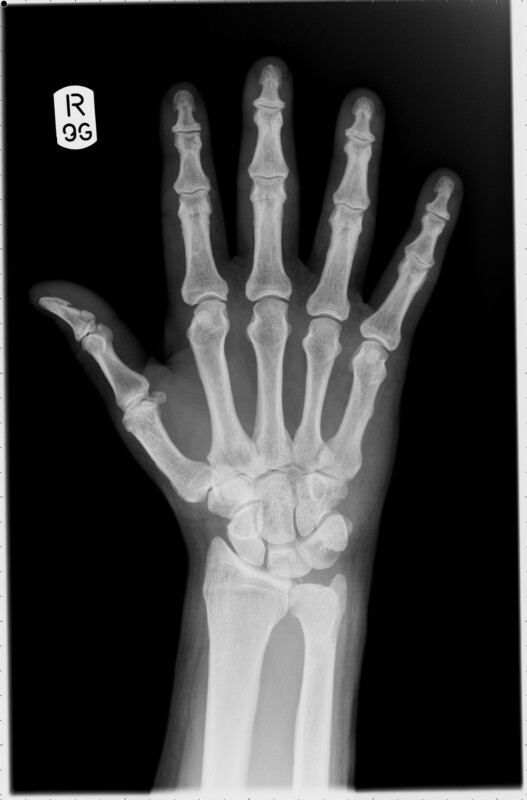 Our modern method makes it easier to detect issues in the bones as they are the lighter areas. Röntgen was awarded the first ever Nobel Prize for Physics in 1901 for his pioneering work in this field of physics. 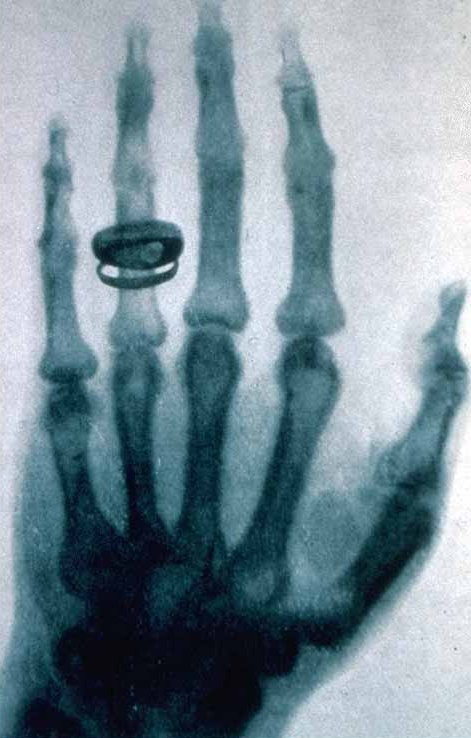 Medical imaging has come a long way since Röntgen’s discovery of x-rays. This promotional video from German company Siemens outlines the advances that have been made since the early 20th century. We spent some time looking at the physics of ultraviolet radiation last week. The section of the electromagnetic spectrum with wavelengths ranging from 10nm to 400nm is called ultraviolet radiation (uv for short). Sunlight contains uv rays and it’s those uv rays that are responsible for the suntan you get during the summer holidays. This Australian animation shows how the ultraviolet in sunlight causes our skin to tan and explains why too much uv will damage our skin. The SunSmart page has loads of information on staying safe in the sun. The damage that uv can do to cells is put to good use in some sterilisation equipment, such as this bottle for safe drinking water and the toothbrush sanitiser shown below. The Nobel Prize for Medicine was awarded to Niels Rydberg Finsen in 1903 for his research into the effects of ultraviolet on the bacteria that cause tuberculosis. We used uv banknote checkers in class to view some of the security features built into British banknotes. This image of a Clydesdale Bank £10 note shows part of the pattern that can only be seen under uv light. There is a Bank of England leaflet (pdf) with further information on the security features in our banknotes. Remember that whenever something glows under a uv light, we’re not seeing the uv radiation itself because our eyes can’t detect ultraviolet. Instead, we see the fluoresence; visible light given out in response to the uv falling on the material. Kuba demonstrated fluorescence in class with some uv hair gel. Here he is with some of the gel in his hair. but we don’t see anything until we turn on the uv light. You can even buy genetically modified tropical fish that glow under uv light.